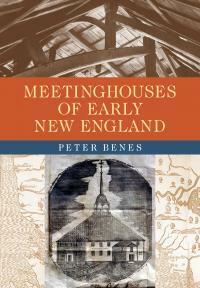 The 2014 Abbott Lowell Cummings Prize was awarded to Peter Benes’s Meeting Houses of Early New England (University of Massachusetts Press, 2012).This monograph is an unparalleled study of a pivotal New England building type. Benes skillfully analyzes material generated from decades of meticulous research to trace the uneven not always predictable transformation of early New England meetinghouses. He brings to bear a plethora of source material, to unearth the multiple factors that impacted the production, transformation and scattered survival of this building type. Benes demonstrates, with specificity, how ecclesiastical practices, precedent, social structure and community aspirations tempered by more mundane realities such ascosts, available building materials, natural forces and increased population converge to forge material culture of the past and the remains that survive into the present. Benes successfully balancesinformed speculation and an appreciation of historical ambiguity with a compelling analysis based on a grounded framework open to the reinterpretation of others. This collegial generosity is particularly reflected in more than eighty pages of supplementary historical data.Meeting Houses of Early New England will remain an important work in Vernacular and New England Architectural studies for decades to come.